Nine talented players started today's final table, but in the end, J.C. Tran was the last man standing. Play got off to a quick start and never really slowed down throughout the day. John Juanda and Theo Jorgensen both made early exits, busting from the event within the first 90 minutes. 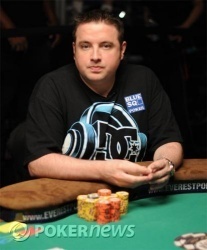 Chad Layne was the next to go and we saw the action tighten up as we reached six-handed play. Tran was in control throughout the day though, often dictating the pace of play. Even after he lost a big portion of his stack when he doubled up Jean-Paul Philippe in the middle stages, he continued to play aggressively, and quickly recovered. By the time we were down to four players remaining, Tran had built a comfortable lead and entered heads-up play with Jeff Kimber as a 2-1 favorite. He never lost that lead and finally took the bracelet when he got Kimber to call all in while drawing dead to a made full house. This is Tran's third cash of this year's WSOP and his second career bracelet, coming just a year after the first he earned in a $1,500 No-Limit Hold 'em tournament. Jeff Kimber Eliminated in 2nd Place ($145,656), J.C. Tran Wins! 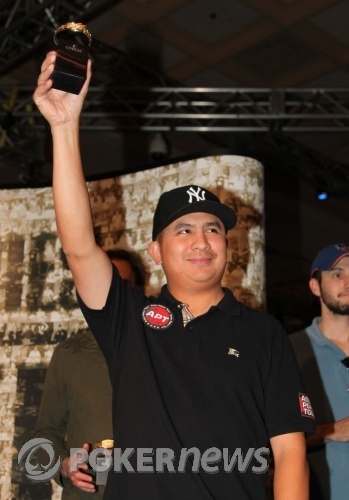 Jeff Kimber opened for 120,000 from the button and J.C. Tran called from the big blind. The flop came down . Tran checked to Kimber, who bet 75,000. Tran made the call. The turn was the and Tran led out for 100,000. Kimber moved all in and Tran called. Tran's supporters erupted in cheers as the hands were turned over, Tran with eights full of sevens and Kimber drawing dead. 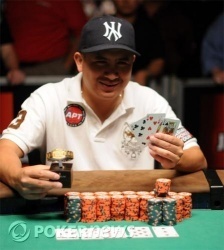 The river was the and Tran at last had all the chips in front of him, winning his second WSOP bracelet and $235,685. For his runner-up finish, Kimber will take $145,656 back to England. Jeff Kimber limped from the button and J.C. Tran checked his option, bringing a flop of . Both players checked and we saw the on the turn, along with a 50,000 bet from Tran and a fold from Kimber. As heads-up play has progressed, the crowd around the secondary feature table has swelled. Chino Rheem (on break from the $10K LHE), John Myung, Amnon Filippi, Michael "The Grinder" Mizrachi and Nam Le are intently watching Tran from behind his side of the table, while about a half-dozen Kimber fans are assembled behind the dealer's side of the table. Both players limped in and saw a flop. They both checked and went to the turn which fell the . Kimber check-called a 50,000 bet from Tran. The river was a third seven, the . Kimber checked, Tran made a pot-sized bet and Kimber released his hand. Jeff Kimber limped from the button and J.C. Tran checked, taking us to a flop of . Tran bet 50,000 and Kimber called. The on the turn brought a 100,000 bet from Tran and a fold from Kimber. J.C. Tran limped in from the button and Jeff Kimber checked. The flop was and both players checked. When the turn fell the , Kimber led out for 60,000. Tran called. The river came the , pairing the board and putting a flush possibility out there. Both players checked. Let's see the cards! Both players made the same straight and split the pot. J.C. Tran opened for 120,000 from the button and Jeff Kimber made the call. The flop came and both players checked. The on the turn brought a bet of 200,000 from Kimber and a request for a count of his remaining chips from Tran. After a short time in the tank, Tran gave up his hand.